The stand-alone, OMR-only OpScan® 16 scans at 10,800 sheets per hour and includes a PC controller as an integral component. Transport printer prints alpha/numeric messages, batch or serial numbers, validation flags, scores, etc. The OpScan 16 accommodates either Mark Reflex® or Trans-Optic® forms between 3.25″ x 7.5″ and 9″ x 12″ in size. The OpScan 16 scanner allows access to the roller assemblies and read heads so they can be periodically cleaned and paper dust/chaff removed. Reader performance is constantly monitored and specific reasons for halts are immediately displayed to the operator. The control panel contains indicator lights for each of the paper sensors to warn operators if sheets are in the paper path, so the sheets can be removed before they resume scanning. For added convenience, operators can choose to resume or stop the scanning process at the touch of a key on the computer keyboard or the single Ready button on the control panel. The OpScan 16 includes a Scantron-certified PC controller as an integral component. 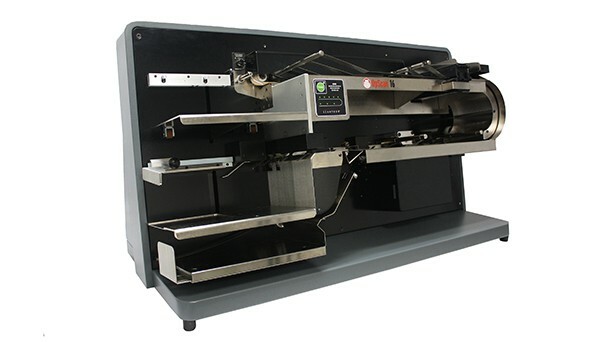 Although based on a standard PC framework, this controller includes proprietary software and/or hardware that have been installed, tested, and certified by Scantron to work with high-speed precision production scanners. The certified controller is considered to be a proprietary component of the scanner. The controller is warranted and supported as a scanner component. Contact a Scantron representative for further details.